Allusions Hair does not ship internationally. This sophisticated dermatological anti-inflammatory agent that reduces dermatitis (dandruff and oily scalp), helps normalize the size of sebaceous glands of hair follicles, helps remove dead skin cells from skin and pores and reduces the inflammatory process. Biomedic Shampoo Treatment is a gentle cleansing product made of complex organic components. Amino acids help repair and restore each hair strand. This shampoo contains generous amounts of all 21 amino acids in free form, in the exact ratio found in human hair. Most people who suffer hair loss have an oily scalp. Some conditioners use oils and waxes that build up on the scalp and create problems; there are better ways to hydrate and condition the hair. Biomedic’s Advanced Styling Conditioner conditions the hair by restoring the moisture balance at a molecular level, dramatically amplifying hair volume and style. Formula MX4 is designed to act more efficiently than other Minoxidil-based products. It contains 5% Minoxidil along with a high level of Hyaluronic Acid that maximizes delivery of the other active ingredients to the subcutaneous layer of tissue and increases tissue hydration; 3% Azelaic Acid acts as a powerful topical DHT blocker; a vasodilator dilates tiny blood vessels in the skin. Use this product with Enhanced CoEnzyme. Research shows that 98% of scalp levels of DHT (a key factor in hair loss) can be blocked with the combined daily use of MX4 and Enhanced Co-Enzyme. 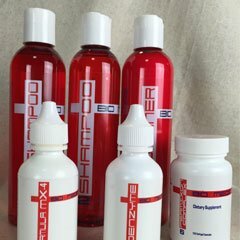 Simply stated, these two products are the most effective topical combination in the marketplace today. Enhanced Coenzyme contains Pyridoxine Hydrochloride (B-6), which combines with the Azelaic Acid in the Formula 1500 Triple Strength to become an extremely efficient blocking agent for DHT (a key factor in hair loss); this product also contains 3% biotin in solution, which helps the skin metabolize DHT more quickly. When used in conjunction with Formula 1500 Triple Strength – our triple strength Minoxidil product – Enhanced Coenzyme maximizes hair growth potential. The two combined are the most effective topical combination in the marketplace today. Most men and women lose their hair due to the body’s natural production of DHT. In the 70s French scientists discovered that properties within the Saw Palmetto Cactus reduce the body’s ability to produce the enzyme that converts testosterone to DHT. The Saw Palmetto Cactus grows wild in Florida, where it was long used by Native Americans as an herbal medicine. Today you will find Saw Palmetto derivatives on the shelves of many vitamin shops. Quality and price depend on the part of the plant that’s used – berries, leaves or roots. Biomedic’s Permixon Complex uses the berries – these are the tiniest part of the plant and the most expensive to process. They are squeezed and tested for presence of the desired properties. Pumpkin seed enhances the strength and effectiveness of our product. A natural deep-cleansing shampoo that loosens build-up and debris on the scalp and hair creating a healthy environment for growth of dormant hair. A cleansing shampoo specifically designed to be used in conjunction with hair coloring products. Seals in hair color while enhancing shine and hair growth. 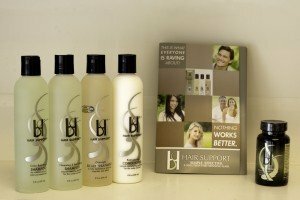 Hair Support Restructuring Conditioner is a specifically formulated light and natural restructuring conditioner for the scalp and hair. Hair Support Restructuring Conditioner retains moisture, restores balance and manageability to thinning, damaged and otherwise challenged hair. Hair Support Foaming Styling Mousse has been specifically formulated for thin fine hair. It is oil free but moisture rich, giving your hair volume, body and styling ease without stickiness or weight. Silk Protein Amino Acids and Panthenol condition strenghten hair wet or dry. This environmentally conscious product is alcohol free and PH balanced. A patented treatment that deep cleans hair follicles and the scalp potentially leading to the growth of dormant hair. Designed to be used with Hair Support Cleansing & Revitalizing Shampoo and Restructuring Conditioner. Toppik is an amazing complex of organic protein microfibers made of pure Keratin which is the exact same protein that makes up human hair. A balancing and equalizing moisture-enriched cleanse shampoo. A deep conditioner that provides intense restoration with pro-vitamin B5 and essential amino acids to re-energize dry hair. Restores vital moisturizers and leaves hair full-bodied, manageable and easy to style. Protects and restores wet or dry hair utilizing moisture enhancing elements. Smoothing styling gel enriched with natural enhancers to build body and shine. Defines, directs and shapes wet or dry hair while adding texture and flexible hold. Natural holding spray for wet or dry hair. The Mediceutical Products are formulated to target specific needs of the hair and scalp. These are the finest professional products for treating thinning hair, common scalp disorders, and unhealthy hair conditions. These products are formulated for repairing and protecting extreme cases of dry, damaged, fragile, fine and thinning hair. They promote beautiful healthy, virgin hair quality. FDA approved and clinically tested. Laurel Sulfate fee. 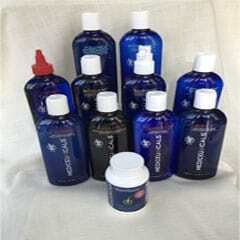 Reacidifies hair& scalp. Enhances manageability. Imparts shine. Fortified with antioxidant vitamin complex. Safe for color treated hair. Stimulates hair cell metabolism & follicle development. Helps inhibit harmful DHT formation. Enhances follicle micro-vascular circulation. Encourages new hair growth. Safe for color treated hair. Treats excessively oily scalp, hair, and skin. Soothes inflamed & irritated scalp. Controls oily, flaking, & itchy scalp. Safe for color treated hair. Controls flaky, itchy scalp. Treats persistent dandruff & psoriasis. Safe for color treated hair. Rinses 100% clean. Stops hair breakage. Restores moisture, shine, and elasticity. Replaces vital amino acides. Reduces thermal damage by 58%. Repairs cuticle damage & split ends. Increases hair diameter by 26%. Natural Acidifying Rinse that is weightless, oil and wax free. It is a rinse that detangles and reduces static electricity. It is color safe, and rinses 100% clean. Features Tipella, which is a hair growth compound. Aloecure hydrates the scalp & hair. Controls dry, flaky, scalp. Has an anti-fade color retention complex. Rinses 100% clean. Softens & conditions coarse hair. Provides cuticle moisture. Has an anti-fade complex. Is safe for color treated hair. Rinses 100% clean. Kills topical bacteria & fungus. Calms redness, itching, & inflammation. Controls excessive oily skin. Can be used as a face & scalp astringent agent. Can be used with X-Folate for effective psoriasis treatment. Re-acidifies hair & scalp. Helps control flaking & itching scalp. Promotes healthy scalp environment. Excellent detangler while improving manageability. Imparts shine. Safe for color treated hair. Rinses 100% clean. Provides your body with the nutritional support it needs to maintain healthy hair. Features a natural complex to prevent hair loss. It has a DHT blocker.